One of the common reasons people and businesses use VPNs is for privacy. If you don’t use a VPN, your Internet traffic — everything you do online — can be traced back to your home or business IP address. So what if you aren’t doing anything illegal? Aren’t your private conversations supposed to be PRIVATE? Why not just put a megaphone on all your phone calls and print all your search engine searches on paper and plaster them on your windows? It’s because we expect a reasonable amount of privacy as human beings. Here are two illustrations of what life is like before and after using DarkWire VPN. 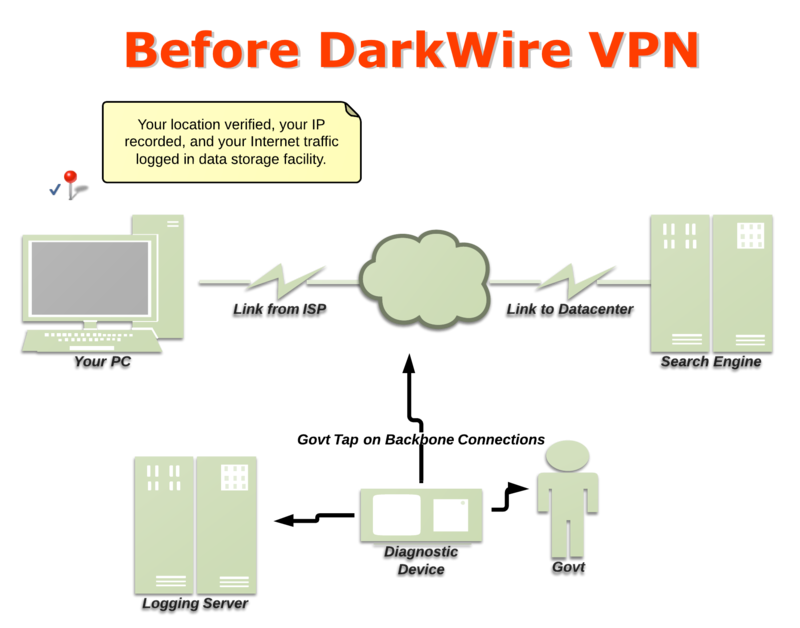 Dark Wire VPN specializes in providing secure communications products and services. Our clients include companies large and small, non-profit organizations and individuals. Whether you need a temporary VPN service or an end-to-end encryption solution, our staff will work with you to find the best solution for your need. Dark Wire VPN offers private individual VPN accounts. Using our signup page, you can quickly and easily create your own account within minutes. E-mail support is available for our customers. Once you create an account, please visit the Support section for details on setting up your VPN. We are able to provide PSK (pre-shared keys) or Client Certificate solutions for your remote users. We can make an unique certificate just for your organization. We can utilize unique certificates for each individual worker. We strive to provide secure communications in some of the most challenging environments. At DarkWire VPN, we are fanatical about security. Hey, WE use this product, too. We don’t want anyone snooping on our Internet usage, tracking searches to our home IP addresses or any of the other junk you’ve been reading about in the news. That’s why we offer optional private key encryption for people in bad places, and it’s also why we do not store connection or usage logs. If you are currently using a VPN provider who offers you the Cisco AnyConnect client, you need to be aware that MANY versions of the Cisco AnyConnect client are vulnerable. You can read more by viewing this link on Cisco’s site. Please note that some other VPN carriers still offer PPTP connections. This is about as bad as plain text. You can read this link or this other link for more information.